I’m in Paris for the first time, and I was given one piece of advice to help me fit in: Don’t wear shorts. Europeans don’t, which means doing so is a surefire way to be pegged as a tourist. This is generally but not entirely true. The crowds at the French Open, in Roland Garros, do wear pants more often than shorts, even though it’s been hot, and they are generally the most stylish tennis crowd I’ve yet seen. VIPs at the U.S. Open dress gaudier than those occupying box seats in Paris, but they’re balanced out by the distressingly large number of fans who arrive in full tennis gear — headbands, wristbands, Nike shoes — as if they fear unpreparedness should Rafael Nadal be in desperate need of a hitting partner. I have seen no white knit shorts at the French Open, and relatively few ball caps. They’re outnumbered, or nearly so, by white and tan Borsalinos, given for free to those in the ritzier sections. The players seem to take their fashion cues in Paris from the crowd as well: subtle style, with class rather than glitz. The opening of the French Open has been uneventful for the top men’s seeds, per usual, with the only notable upset occurring in the fashion world. Last week, Novak Djokovic announced that he had signed a five-year apparel contract with Uniqlo, a Japanese clothier you’re obsessed with if you’re young and into bright colors and live in New York — or anywhere in Asia — but otherwise probably know nothing about. Djokovic walked onto the court for his opening-round match on Monday with, far as I could count, 15 red Uniqlo logos. From top to bottom: two on his cap, one on his left breast, two on his right biceps, two more on his left thigh, and four smaller pairs, one on each sock and wristband. (Anywhere two congregated, one of them had the company’s name in Japanese.) The outfit was rather handsome, in a understated Parisian way, and far better than anything he had been offered by his old sponsor, Sergio Tacchini. (They occasionally featured dragons.) The shorts were navy, while the shirt and cap were white and had just two flourishes: a pair of slim lines of red and blue from shoulder to armpit, and a neckline that opened with a zipper rather than buttons. (In Round 2, he wore the same kit with a color reversal: navy top, white shorts.) “How do you like your new outfit?” a Japanese reporter (a Uniqlo plant?) asked Djokovic after the match. He was wearing a Uniqlo warm-up and declared that he loved it. “How about you?” he replied. She loved it, too. The switch in wardrobe was so recent that the video board in Roland Garros Stadium introduced Djokovic with an image of his old kit, from Sergio Tacchini. The tale of that contract is one of the more interesting in the relatively uninteresting history of athletic apparel endorsements. Grantland’s Louisa Thomas has covered it in some depth, but to boil it down to the fun part, Tacchini was a once prominent tennis label — a young Pete Sampras was an endorser — that had been eclipsed by Nike, Adidas, and the rest when, out of nowhere, it signed Djokovic, in 2009. The deal was quite long — a decade at least — and laden with performance incentives. As you may have heard, Djokovic had a decent year in 2012. Details have not been released, but it’s safe to say he earned nearly every one of those bonuses, which seems to have played at least some role in driving Tacchini to financial strife. The company reportedly couldn’t make some of the payments (they deny this), and had trouble actually making any money off of Djokovic. American retailers complained that Tacchini, based in Italy, rarely got them Djokovic’s outfits in sufficient quantities, and sometimes not at all. Roger Federer hats populate junior tournaments the world over; I’ve never seen anyone in a Djokovic shirt. Whatever the reason, Djokovic finally had enough, and so the world’s no. 1 player was walking the runway in Paris as Uniqlo’s new “Global Brand Ambassador.” The deal is especially surprising because Uniqlo, which specializes in relatively inexpensive cashmere sweaters in every color imaginable, makes hardly any athletic gear at all. Given that, the Serb is just about as prominent as they could reasonably hope to hire. (Athletes in team sports often have only their feet to offer potential sponsors.) Most of the top men’s players have head-to-toe deals: Federer and Nadal both wear Nike, while Andy Murray’s in Adidas. Djokovic’s deal stops at his ankles, simply because Uniqlo has nothing to put below them: They don’t make shoes. Figure skaters aside, tennis players have more leeway in their outfits than just any athlete, though that freedom exists to different degrees in different places. The All England Lawn Tennis Club, where Wimbledon is held, still has an all-white dress code — it will be dropped for the London Olympics, to allow for patriotism — while the U.S. Open is a chance to fly all manner of freak flags. In Australia, everyone’s just trying to keep cool. Sponsorship at Roland Garros is more precarious than most: By the end of a match, your logo might be covered in dirt. (This rule, like many others, doesn’t apply to Federer, who wore his all-black Darth Vader outfit in a first-round win and hardly broke a sweat, let alone kicked up any dirt.) 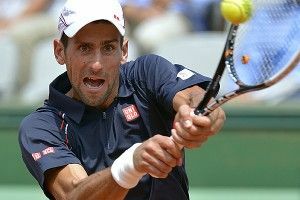 By the second set of his opening match, Djokovic had dirt up to the lowermost logos, on his socks, and before nearly every point, he smacked the side of each shoe with his racket to shake off the excess clay. I’m sure Adidas, which handles Djokovic’s kicks in Uniqlo’s absence, was appreciative.